What is the purpose of dissent in the Supreme Court? To cry foul, to persuade, to sensationalize, to fight? A dissenting opinion is not law and serves no official function; at times, it can seem like petty ankle-biting. What, then, is the point? The Court’s recent decision striking down state laws that banned gay marriage offers a fascinating case study. Obergefell v. Hodges, handed down on June 26 and written by Anthony Kennedy, holds that such laws violate the 14th Amendment’s due-process and equal-protection clauses. It was an extraordinary triumph for liberty and equality, but the four dissenting justices did not think so. To mark their strenuous opposition, each wrote a separate dissent; their efforts add up to twice the length of the majority opinion. The four conservatives did more than sign the intolerance ledger in the big book of judicial history, warm in the company of scowling brethren from years past. They also told us much about themselves, and even more about dissent as an institution. Dissent and the Supreme Court: Its Role in the Court’s History and the Nation’s Constitutional Dialogue. Roberts’s opinion is unpersuasive. And yet it has the mark of a good dissent: After reading it, even a strong supporter of the majority’s position feels a stirring of doubt. Perhaps the Court should have allowed the democratic process, which favored gay rights, to continue. And Kennedy certainly could have done much more with the equal-protection argument. The opinion is incisive and closely reasoned; it finds the majority’s weak points and bedevils them with arguments that did not prevail but may endure. In this, it recalls one of the better dissents of Roberts’s mentor, former chief justice William Rehnquist, in Roe v. Wade. Roberts’s dissent stands out for its rhetorical sure-footedness. Very much unlike his colleague Antonin Scalia, Roberts knows how to measure out doses of vinegar. Chiding but not lampooning Kennedy’s penchant for lofty phrasing, Roberts writes, “There is, after all, no ‘Companionship and Understanding’ or ‘Nobility and Dignity’ Clause in the Constitution.” Amusingly, Roberts begins and ends his dissent with a show of his own personal open-mindedness on the issue of gay marriage. He is a persuasive enough writer that you might almost believe him—if you didn’t know how conservative he is. With Scalia, there is no such mystery. 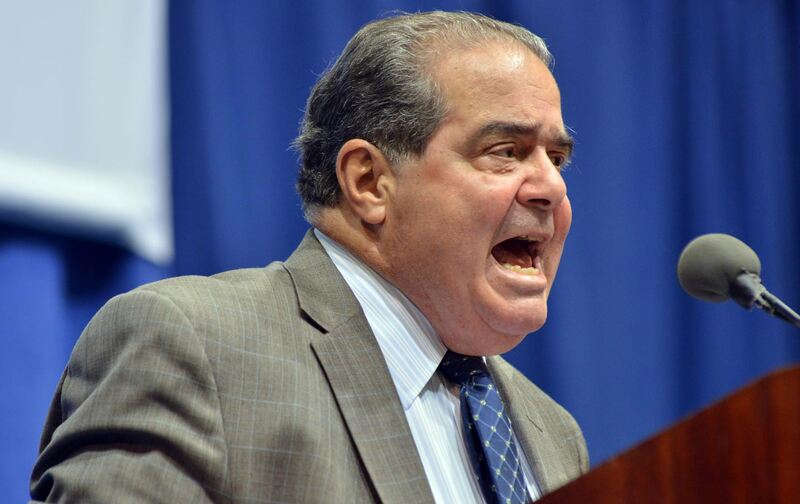 His dissent begins with an apocalyptic boom: “I write separately to call attention to this Court’s threat to American democracy.” Scalia then affects a casual disinterest in gay rights—“The substance of today’s decree is not of immense personal importance to me”—but this is a transparent pose. His vile antigay rhetoric in previous dissents in Romer v. Evans (1996) and Lawrence v. Texas (2003) renders his disclaimer preposterous. If Roberts writes for posterity, Scalia writes for the headlines. His dissent overflows with outrageous insults to his colleague Kennedy, who filled his opinion with “straining-to-be-memorable passages” equivalent to “the mystical aphorisms of the fortune cookie.” Scalia even says he would rather hide his head in a bag than endorse Kennedy’s maudlin prose. These lines are colorful, but they obscure the purpose of Scalia’s dissent, which is never entirely clear. He focuses on judicial restraint, but Roberts already covered that. He is not persuading anyone except the Fox News crowd; only Clarence Thomas joined his opinion. And he certainly isn’t writing for future generations, who tend to disfavor strident holdouts on civil-rights progress. Scalia’s dissent gives the impression of a sore loser who likes the limelight. The remaining dissenters, Thomas and Samuel Alito, have different audiences entirely. Here, as ever, Thomas writes for himself. His goal as a justice is apparently to hold a completely unified and consistent legal philosophy, even if—especially if—he holds it alone. No one on the Court today spends so much time questioning settled doctrine. Hence Thomas devotes his dissent in Obergefell to attacking the very notion that the Constitution encompasses rights like privacy and marital autonomy. The Court rejected this position decades ago in Griswold v. Connecticut (1965) and Loving v. Virginia (1967). Yet the key for Thomas is not to win, but to sleep with a clear conscience on a featherbed of lofty principles. By contrast, Alito writes to give voice to conservative resentment. He laments the way the Court’s decision “will be used to vilify Americans who are unwilling to assent to the new orthodoxy” on gay rights—those who “risk being labeled as bigots” if they say that gays should be excluded from marriage. (Alito was famously asked if he was a bigot during his Senate confirmation hearings in 2006.) In this sense, Alito’s opinion serves more of a political than a legal purpose. Written in a tone of surly grievance, it is the least persuasive dissent of the bunch. So: four dissents, but gay equality is now the law of the land. Surely these four justices, all savvy men, know that the Republicans have long since lost the battle against gay rights. Perhaps several of them felt so strongly that their consciences would not let them keep quiet. One senses also in their collective effort an attempt to invite a backlash against the Court’s decision, as in Roe v. Wade. This seems a petty motivation. If the four dissenters placed the Court itself above themselves, they would want its decisions to have legitimacy before the public. But these days, some justices would sooner light a fire. Obergefell came down after Melvin Urofsky completed Dissent and the Supreme Court, his historical study of dissent’s role in our constitutional system. That is a shame, because Urofsky would have had any number of insights into the case; he devotes many pages to the gay-rights decisions leading up to it. An eminent legal historian known for his superb biography of Louis Brandeis, Urofsky counts himself a strong supporter of dissent, which he calls “essential to our nation’s well-being.” His book is a fascinating—­if at times dry and encyclopedic—­tour through the Court’s dissenting history. It dissects the many purposes of a dissent, some of them on display in Obergefell: to facilitate a future change in the law, to invite action from Congress, to provoke public scrutiny of the Court, to nitpick, to limit the scope of a majority decision. Dissent and the Supreme Court also illustrates a paradox: While a robust dissenting tradition encourages the free exchange of ideas, the Supreme Court unquestionably speaks most forcefully when it uses a single, unanimous voice. The nation’s greatest chief justice, John Marshall, loathed dissents. Remarkably, in his 34 years on the bench, from 1801 to 1835, he filed only seven of them. (By contrast, William O. Douglas, who served from 1939 to 1975, wrote 486.) Marshall aggressively sought to ensure that the Court spoke as one body, modifying his opinions at the request of colleagues and spreading the view that fractured decisions harmed the Court’s prestige and authority. As another legal commenter put it: “There never should be a dissenting opinion in a case decided by a court of last resort. No judge, lawyer or layman should be permitted to weaken the force of the court’s decision, which all must accept as an unappealable finality.” Marshall ensured unanimity for the great decisions that established the Court’s role as a co-equal branch of government: Marbury v. Madison (1803), Fletcher v. Peck (1810), and McCulloch v. Maryland (1819). Ironically, Marshall’s specter created the first regular dissenter in the Court’s history. Justice Joseph Story served with him, then remained on the Court after the chief justice’s death in 1835. Story dissented repeatedly in a series of cases dealing with congressional power and states’ rights, insisting that things would have come out differently were his nationalist friend still alive: “Mr. Chief Justice Marshall is not here to speak for himself.” He also softened his dissents with florid disclaimers: “I trust that the deep interest of the questions, and the novelty of the aspect under which some of them are presented, will furnish an apology for my occupying so much time.” Judicial courtesy would travel a long road between that proviso and Scalia hiding his head in a bag. If Story’s dissents looked backward to a bygone time, the Court’s first truly landmark dissenting opinion envisioned a day when the law might come around to its side. Benjamin Cardozo memorably said that the dissenter who writes for the future does so with “the glow and fire of a faith that was content to bide its hour.” In Dred Scott v. Sandford (1857), the Court held that a black slave was not a citizen and lacked the standing to sue for his freedom. Justice Benjamin Curtis filed a dissent that has been called “one of the great masterpieces of constitutional opinion-writing,” eviscerating the Court’s reasoning and disproving its assertions of fact. After the Civil War, Congress took his side and overruled Dred Scott with the Civil Rights Act of 1866. Justice John Marshall Harlan I carried forward Curtis’s prophetic civil-rights vision with major dissents in Plessy v. Ferguson (1896) and the Civil Rights Cases (1883), which limited the reach of the 14th Amendment following the Civil War. Urofsky suggests that the two great dissenters in the Supreme Court’s history are Oliver Wendell Holmes Jr. and Louis Brandeis. This is not a novel view, but it is surely right. Both justices emphasized judicial restraint, taking exception to the majority in a period of aggressive conservatism. A master of the brief, eloquent opinion, Holmes wrote the famous dissent in Lochner v. New York (1905), opposing the Court’s use of the now-reviled “liberty of contract” to strike down a state law regulating harsh working conditions. Brandeis, by contrast, wrote dissents like dictionaries, loaded with facts and prescient in their analysis. He laid the groundwork for the right to privacy in his landmark dissent in Olmstead v. United States (1928), arguing that wiretapping without a warrant violates the Fourth Amendment. He also helped develop the modern approach to free speech in a concurring opinion in Whitney v. California (1927). Brandeis and Holmes often joined each other’s opinions. In order to remain potent, they dissented rarely. Surprisingly, Urofsky devotes little attention to the great era of unanimity in the Supreme Court’s modern his­tory: the civil-rights movement. Under Chief Justice Earl Warren’s leadership, the Court handed down unanimous decisions in Brown v. Board of Education (1954), outlawing segregation; Cooper v. Aaron (1958), requiring states to comply with federal law; and Katzenbach v. McClung (1964), upholding the Civil Rights Act of 1964. Superficially, it is obvious why Urofsky overlooks this period: There were fewer dissents. But a unanimous decision is a dissent outsmarted, and seems a natural subject of study here. For this reason, William Brennan also deserves more attention than he receives. His tireless coalition-building and horse-trading in the 1950s and ’60s didn’t always forestall dissent, but it did put together winning majorities. Disappointingly, Urofsky pays almost no heed to the Court’s most powerful modern dissenter: John Paul Stevens. In some ways, he combined the eloquence of Holmes with the persuasiveness of Brandeis, writing brief, powerful dissents—for example, in Bush v. Gore (2000)—as well as massive doorstops in Citizens United v. FEC (2010) and District of Columbia v. Heller (2008). His retirement in 2010 wasn’t merely a loss for progressives, but for dissent as an institution. A vital part of the Supreme Court’s tradition, dissent is also a tribute to its institutional strength, having survived intense disagreement for 227 years. And yet it’s hard not to conclude after studying a decision like Obergefell that dissent today is both too common and too nasty. Justices have become so accustomed to having their say that they rarely put the Court’s prestige above their own reputations. And corrosive rhetoric like Scalia’s does more than fray relationships on the Court; it convinces the public that the justices are political stooges. But the primary lesson of Obergefell is this: A dissent will never one day become the law of the land when it’s on the wrong side of history.